^That little circle of hair wrapped around my pony tail is supposed to cover the hair tie.... oops ha! This last Thursday Chanse and I went on a little day date to the LDS Temple, and it was just what we needed. My sweet sister was kind enough to watch Rosalie for me, and I don't think Rose even noticed I was gone because she was having so much fun. Rosalie actually took a pretty good nap for me that day so I had some time to try a new hairstyle. 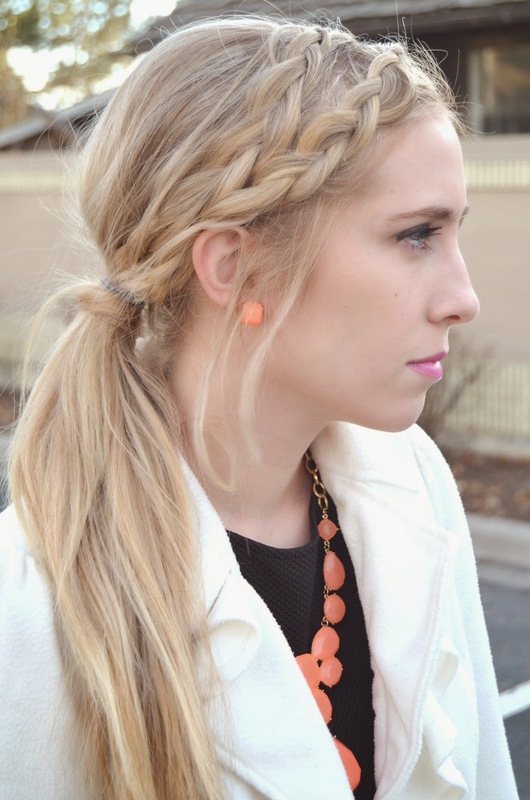 I got my braid inspiration from the blogger Amber at Barefoot Blonde. You can watch her tutorial here! I changed it up a little bit and did two dutch braids instead of one dutch braid and one fishtail braid, but it is pretty similar. And because I was so proud of myself that I wore my hair like this for the next three days (yes, I showered ha, I just didn't wash my hair). Bottom: Court and Brady invited us to dinner with them after we went to the temple, and we ate at Mountain West Burrito. I have really been wanting to try Waffle Love, but I was craving something salty instead that night. I will have to try the waffles next time. Have any of you Provo/Orem people tried either of these places? What did you think? Beautiful hair.Love your coat also! I love the way you styled your hair in these photos, the braids are so lovely! Thank you Cee! I had a lot of fun learning how to do them! You did a great job on those braids! I love all of Amber tutorials! Thank you Adri! Aren't her tutorials awesome?! Aw, what a cutie pie little girl! Your hair looks amazing. I am so bad at doing my hair! Thank you Rachell!! I'm sure your hair is gorgeous though! I love Amber Fillerup!!! I spent like 3 hours watching her tutorials the other day!!! Love your braids girl, you did a great job!!! I love her too! Her tutorials are super fun to try! 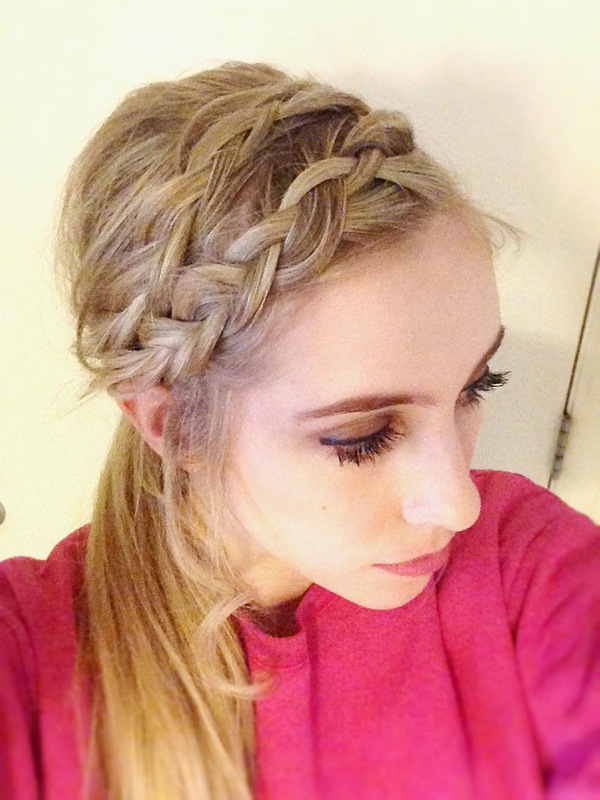 Love your braids! I am awful at braiding, and always envy those who make them look so beautiful! I love this hairstyle! So pretty! Also, love the color of that skirt! 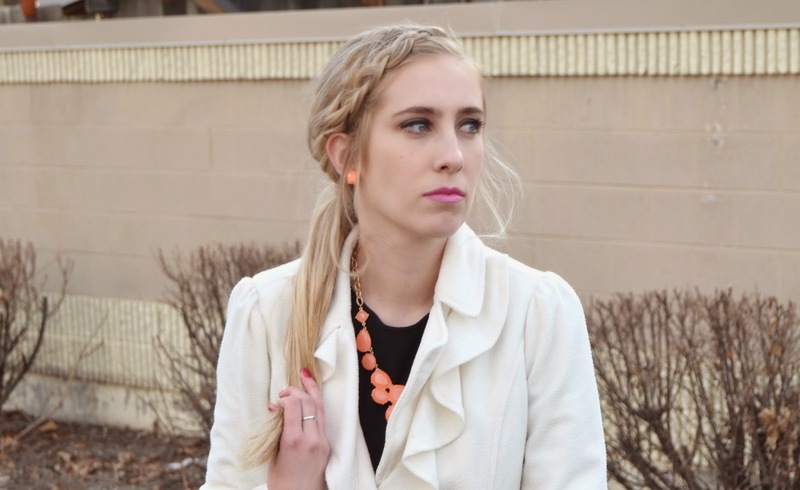 Love that peachy color for your necklace!! 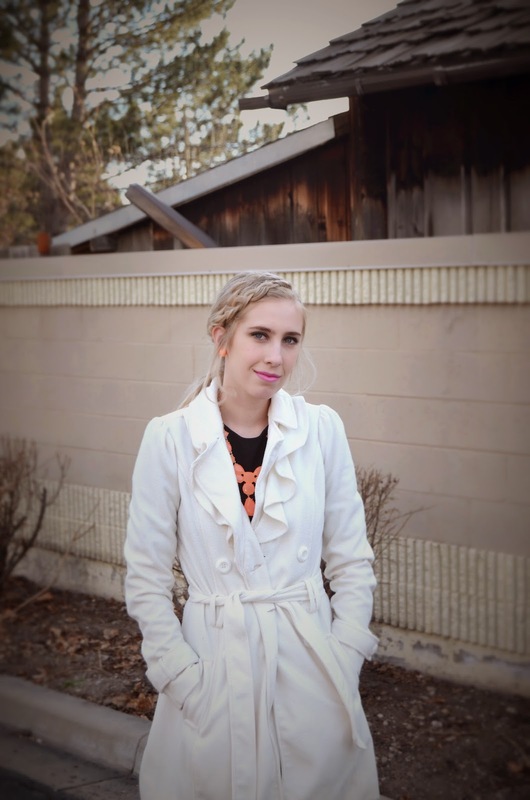 Your braids are so beautiful and organic, Rachel and this outfit is so cute and chic. Thanks for sharing. Have a great Monday!